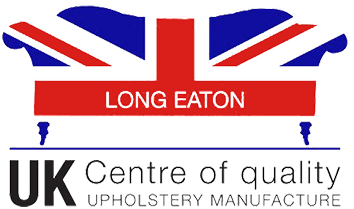 Today, the majority of upholstery now sold in the UK is imported from Eastern Europe, China and the Far East. Virtually all are made on a chipboard frame, which has been stapled together to meet the low price demands of the mass-market retail trade. At PF Collections, each model is manufactured on a hardwood frame, made by skilled frame makers in our own wood mill to such a high standard that we guarantee them for thirty years. We purchase beech or birch hardwoods from renewable sources, usually from Canada, Scandinavia or the Baltic States and all frames are constructed using traditional methods of glued, screwed and dowelled joints. All of our sofas and chairs have some form of steel springs in the seat. We do not use rubber, elastic or polypropylene webbing in the seat, which is typically used in lower quality upholstery. At PF Collections, we use two types of metal spring. The type of spring system our designers select is dependent on the individual design and whether or not the sofa or chair should have a soft or firm sit. For springs, we give a fifteen year guarantee. The guarantees cover all labour and materials used to rectify any guarantee complaints. The collection and re-delivery costs will be the responsibility of the purchaser.